Although I’ll be covering Adobe’s Creative Site 2 in more detail in the Design View, I thought I’d take a look at a new feature that grabbed my attention — ‘Live Trace’. 1) Fiddle with colors, sensitivity sliders, and other more mysterious options. 3) Be generally impressed but not really satisfied. 4) Fiddle with colors, sensitivity sliders, and other more mysterious options. 6) Be generally impressed but not really satisfied. 7) Repeat steps 1 thru 6 four or five more times. 8) Obtain a raw vector graphic I’m happy to start working with. 9) Begin working with an insane hornet’s nests of tangled and interwoven vector shapes. Squeal as cleaning up stray points mysteriousy deletes huge chunks of the graphic from time to time, forcing a backtrack. 10) Admit defeat and hand trace it. 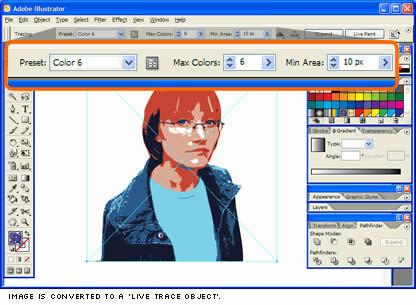 The good news is Adobe may have nailed it now with Illustrator’s new ‘Live Trace’ drawing mode. 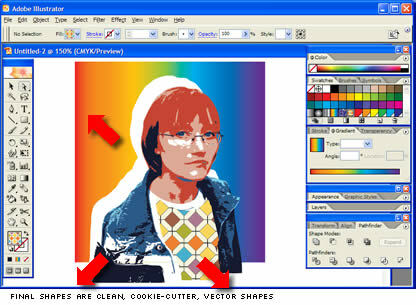 Here’s a quick test I ran a test using our CSS super-guru, Rachel Andrew’s pic from her CSS Anthology book cover. 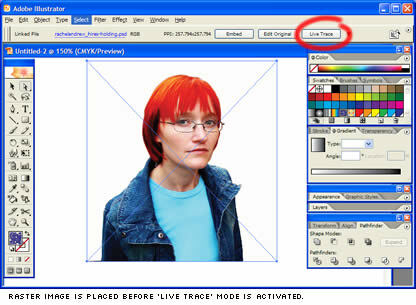 After placing the image in Illustrator, I selected it and switched on ‘Live Trace’. From this point on you are working with what Adobe refer to as a ‘Live Trace Object’, — this is no longer a pure raster image, nor a pure vector object — it’s something else again. You have complete freedom to ‘tune’ the artwork during this phase, with control over the number of colors, line and edge quality, and the size of the smallest rendered object. There is also a comprehensive set of presets, including ‘Photo High Fidelity’, ‘Comic Art’, ‘Technical Drawing’ and ‘Hand Drawn Sketch’. These are usually good places to begin your tuning. 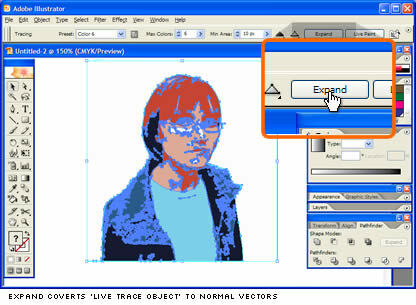 When you’re happy with your artwork, you need to convert it back to a pure vector object by switching out of ‘Live Trace’ with the ‘Expand’ button. So now we have a vector drawing. Big deal, right? The major difference between ‘Live Trace’ and previous built-in auto-trace features is simply the quality of the artwork it churns out. The vector shapes it produces look as if they were made with a ‘cookie cutter’. None of the shapes overlap and they fit perfectly together like a brand new jigsaw. This is a screenprinter’s dream. Of course, you’re always going to want adjust, edit and change the raw conversion, but it’s still a very effective way to get that raw image quickly. All in all, seriously useful and a very handy addition to Illustrator.